Enbio boss found once you got yourself into the right environment you can go forward with great energy and optimism. John O’Donoghue, founder of surface technology company Enbio, is candid about the many challenges of getting a tech start-up off the ground. At NovaUCD are (from left) Nigel Cobbe, vice-president of business development at Enbio, chief executive John O’Donoghue, and Dr James Carton, industrial surfaces programme manager. “I’ve made all the mistakes inherent in such a journey mainly because you don’t know what you don’t know, and all start-ups are subject to the frailty of the human condition,” he says. For Enbio, the “right” environment was the incubation hub at NovaUCD where the company relocated from Cork in 2011. “To me Enbio is a two-year-old company with a history,” says O’Donoghue. “By that I mean we started in 2006 but things didn’t go to plan. We were in the wrong place – a soul-less industrial estate – and ultimately there was a clash of personalities and objectives. We effectively started over when we moved to Nova and haven’t looked back since. “The energy within Nova is infectious and enabling and it’s chalk and cheese when compared with where we were in Cork. On top of this I have UCD and its vast knowledge bank at my back and this really counts when you’re pitching for business to an organisation like the European Space Agency (ESA). They come here and see the facilities and the fact that you have the expertise of the university behind you and it makes them confident that you have the bandwidth to deliver what you say you’ll deliver. “We have been really fortunate to work in an open innovation situation with Prof Michael Gilchrist and his team in mechanical engineering and materials here and there has been a great exchange of ideas around that interaction,” he says. O’Donoghue is a UCD graduate in mechanical engineering who spent 10 years in the medical devices industry before setting up Enbio. The seed for the company was sown when he was working on his thesis for a master’s degree in bioengineering in Trinity College Dublin in 2001. O’Donoghue’s expertise is in surface coatings and he has developed a patented process called CoBlast that sprays a mixed media stream of particles on to the surface of a metal to strip off its naturally occurring oxide layer. All modern light metals have this layer, which makes it difficult to join anything to them. Enbio has developed a method to bypass this natural barrier and coat the surface before the oxide layer grows back. 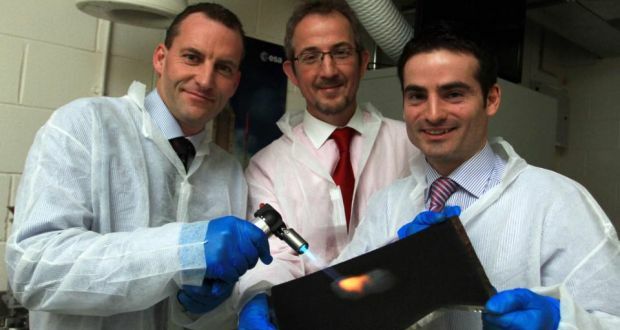 In the case of medical devices (which is where O’Donoghue was initially pitching his technology) coatings are applied to orthopaedic implants to help repel infection and promote healing.